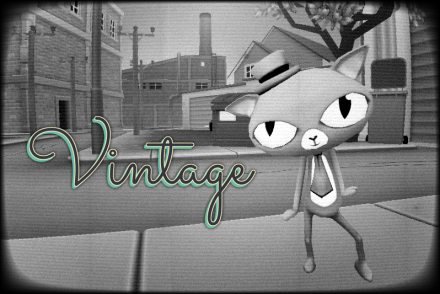 The actual effects are: ramp, shift, dissolve, masks, blend, outline, glass and instagram. Since version 2.0, ‘Sprite Color FX‘ supports lights in all its effects. To activate it, you just have to select the mode you want in ‘Lighting mode’ (1). For now you have the ‘UnLit‘ mode (no lights) and the ‘BumpLit‘ (bump plus specular). In the future we will be adding new lighting modes. When you select the ‘BumpLit‘ mode, you must select a normal texture (4). 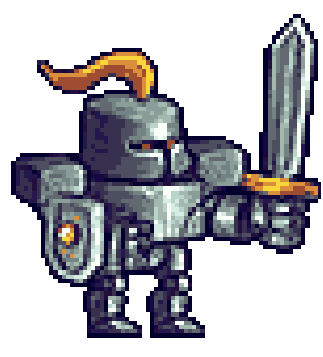 To generate it from your sprites, I‘ve always used the NVidia Texture Tools. 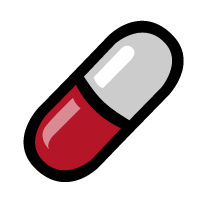 If you want something more designed for 2D sprites, I recommend you Sprite Lamp and Sprite Illuminator. You can also set the shininess (2) and change his color (3). 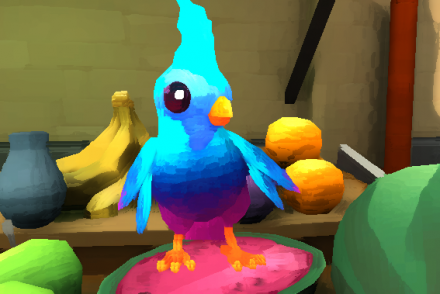 This effect uses the brightness of the pixel (not color), and replace it with another color from a ramp generated by a specific tool. In this tool, you can add five colors palettes and generate with one click all the data necessary to change the color of your sprites. 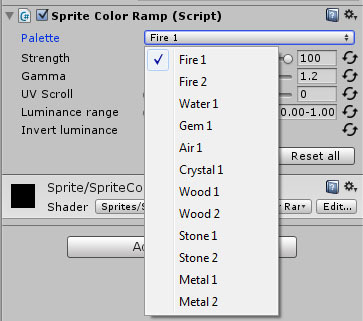 If you only want to modify only certain areas of your sprites, the ‘Sprite Color Ramp Mask‘ component allows you to define up to three different zones. The first thing you need to add some color palettes. To do this, open the ‘Color Ramp Tool‘ (Window > Sprite Color FX > Color Ramp Tool) tool. You will see that it have some palettes. These are some examples, you can delete them ;). Now you can add the first palette by clicking on the button ‘Add palette‘ (1), put an awesome name (2) and select five amazing colors (3). Now click ‘Apply‘ (4) to generate the necessary data. A good place to find good palletes is color.adobe.com. For this example I willl ‘Johnny Cash Tribute‘ palette. Now we need an sprite. The easiest way is to drag a texture imported as ‘Sprite‘ to ‘Scene‘ window. This automatically add the ‘SpriteRenderer‘ component. Then, add the ‘Sprite Color Ramp‘ component (or ‘Sprite Color Ramp Mask‘ if you want to use masks). And select the palette you want to use in the ‘Palette‘ field. Palette: Change the type of palette. 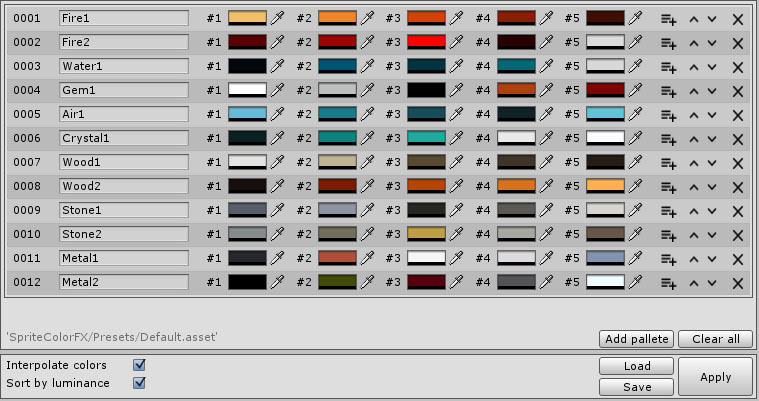 To generate new palettes use the ‘Color Ramp Tool‘ and press the ‘Apply‘ button. Strength: The strength of the effect. If it is set 0, the sprite will be like the original. Gamma: Change the brightness used in the shader. UV Scroll: Move the UV coordinates. Luminance range: If a sprite does not have much range in brightness (very dark or very bright), you can adjust the range used to calculate the brightness. Invert luminance: Inverts the brightness. What if you need more than a palette affects one sprite? 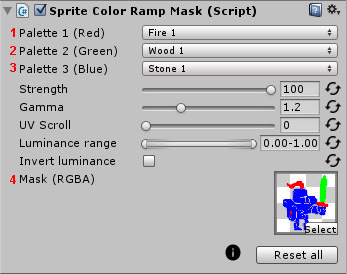 You can use the ‘Sprite Color Ramp Mask‘ component that allow you to define up to three different zones. Palette 1 (Red): Palette affecting the area defined in the Red channel of the mask. Palette 2 (Green): Same in the Green channel. Palette 3 (Blue): Same in the Blue channel. The alpha channel is also used to modulate the result. If 0 (black) the pixel will be like the original, if 1 (white) the result will be calculated with the shader. This effect displaces the color channels (RGB) to create an effect known as chromatic aberration. The displacement can be linear or radial (more effect at the edges and less in the center). Also you can add noise. Green offset: The offset of the green channel. Blue offset: The offset of the blue channel. Noise amount: More noise, more vibrate all channels. Noise speed: The speed of the vibration. Strength: The strength of the effect. With this effect you can make disappear, or appear, your sprites in a very beautiful ways. To do this, another texture is used to indicates the order where the pixels will disappear. This texture must be black and white. The darker areas are the first to disappear. 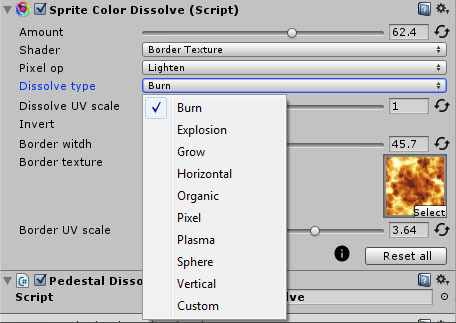 ‘Sprite Color Dissolve‘ brings some textures that you can select from the ‘Dissolve type‘ field. If you want to use your own, select the type ‘Custom‘. Amount: The strength of the effect. Shader: The type of shader used for effect. Can be normal, with a colored border or an border with a texture. Dissolve type: The type of texture used for effect. If you want to use your own texture, select ‘Custom’. 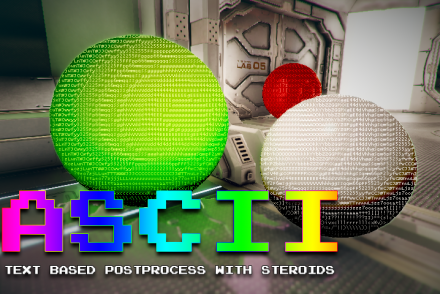 Dissolve UV scale: The scale of the texture used for effect. Invert: With this you can reverse the effect. 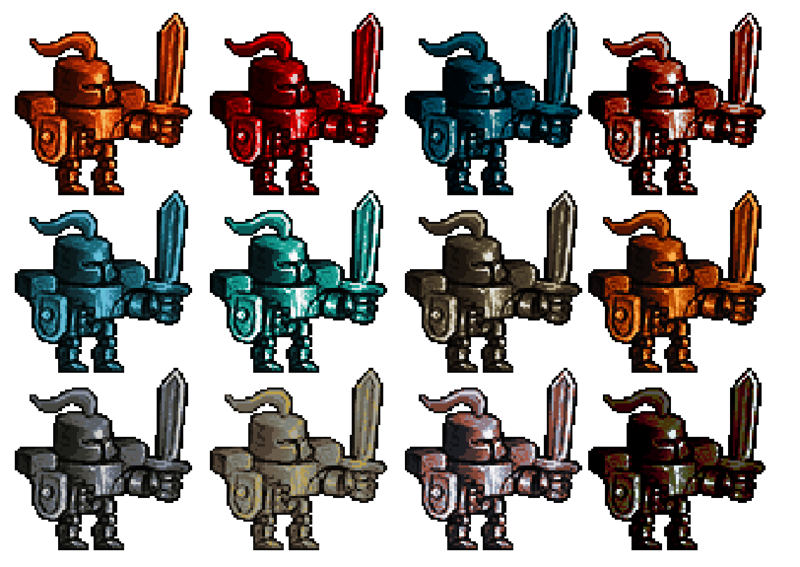 With this effect you can define areas (three now, more in the future) of your sprites and apply effects on them. Notice that the areas can be overlapped. Strenght: the strength of the effect. Blend mode: how the colors are mixed. Strenght: the strength of the effect in that mask. Color: the color applied to that mask. Texture: thetexture applied to that mask. Mask #1: the texture where we defined the three areas. U coord scale: the scale of the u coordinate. V coord scale: the scale of the v coordinate. U coord vel: the speed applied to the u coordinate. V cood vel: the speed applied to the v coordinate. UV angle: the angle applied to the uv coordinates. With this effect you can use more than twenty blending operations, similars to Photoshop™. Now you can select any of the more than twenty blend modes. 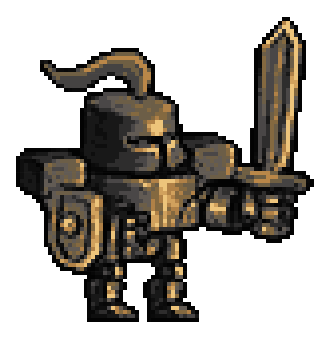 This effect can highlight any sprite in a simple and diverse ways. To use this effect, all you have to do is add ‘Sprite Color Outline‘ component to a sprite. You can use three different modes: normal, gradient and texture. The simplest mode is normal, that lets you use one color to highlight. Light mode (unlit / bump). 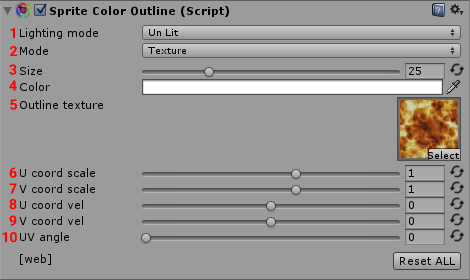 Outline mode (normal / gradient / texture). The color of the outline (RGBA). In gradient mode you can choose two colors for the outline and which direction the gradient is formed. The direction of the gradient (vertical / horizontal). The first color of the gradient (RGBA). The scale of the gradient. With this you can control how wide is the gradient. The offset of the gradient, to move the gradient. In texture mode you can also use a texture to create the outline. To change the color of the texture. From version 2.2, they have added some “advanced” options. Alpha Threshold. Outline effect use the alpha channel of the sprite to know the contour, if your sprite has areas with transparencies, you can adjust the outline using this value. Overlap. 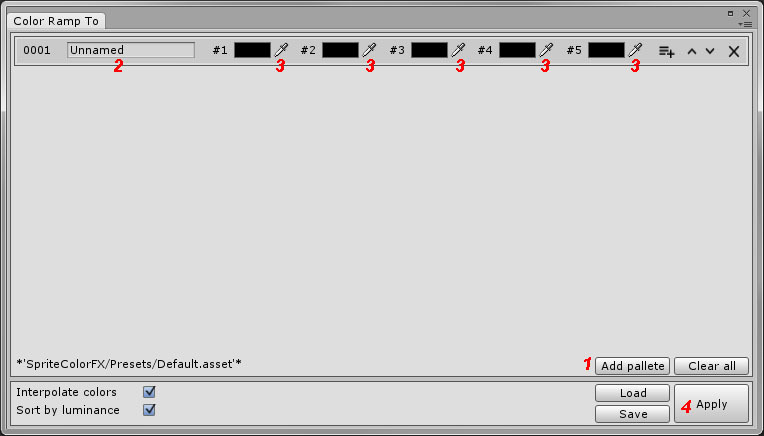 Turn off this value if you want the outline not render on top of other sprites. Custom mask. Do you want set yourself the contour? No problem. Use the alpha channel of another texture to define the area you want. This effect simulates transparency and refraction of a crystal. Strength. The strength of the effect. From 0 (no effect) to 100 (full effect). Distortion. The distortion of the background. Refraction. The distortion of background colors. This effect provides 15 filters of Instagram. Contrast. Contrast of the image. Gamma. Gamma of the image. WHAT VERSION OF UNITY SHOULD I NEED? You need the version 5 or higher. DOES IT NEED ANY SPECIAL HARDWARE? All effects in ‘Sprite Color FX‘ needs a GPU that supports Shader Model 3.0 or higher. At desktop PCs, any card compatible with DirectX 9.0c are supported (ATI Radeon HD2000 or higher, Nvidia GeForce 8/9/GTX200 or higher or Intel GM965 or higher). In mobile platforms, any device compatible with OpenGL ES 2.0 should run fine. Please, check the Apple hardware compatibility lists or search for Android Froyo 2.2(API 8) or higher. In generall, any device with a decent GPU after the 2008 should work. Yes, all source code is included (also shaders). is it possible to use the modified sprites within the Unity UI Image object as sprite? Hi Steve, in the next version we will try to support Unity UI. this package looks great! 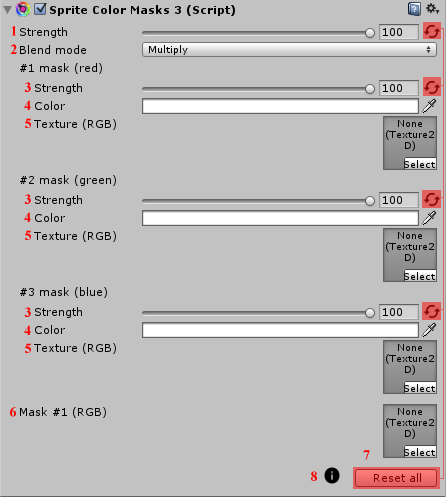 I have only one question – if I have lets say 3 sprite with the same texture, but different masks and color(‘Sprite Color Masks 3‘ component), will it increase draw calls? Thanks! Hi Anrey, thanks you for your interest in our asset! The answer is yes, each sprite would be a different draw call. Does these effects support Unity UI too? Hi, first – nice Asset. I purchased it a while ago and played with the Sprite Color FX Options today. Hi bgp, thank you for your interest in our asset. We have been asked several times to give support for UI, and it is definitely something we will do. Any way you can increase this number? Hi Jason, when we created this plugin we thought that 5 colors would be enough to define a palette, the same that use http://color.adobe.com and other webs. We could adapt the tool to use an arbitrary number of colors per palette. Can you send us an email to ‘hello @ ibuprogames. com’ and tell what you need? Hi Kevin, that is something asked very often. We are working to include it in the next update. Hi there I have a slightly unique scenario that I need to deal with. I’ve posed this same problem on the forums for another plugin that I’m hoping is able to address this issue. Can you have a read and see if there is any way at all that this plugin can help solve the problem? Hi Vincent. Mixing two sprites using a gradient to modulate it is easy (if I understand the post well). But as you say, it’s not too common a scenario. I do not think it is an effect that interests too much those who use our asset. If you want to discuss, feel free to email. As a workaround, I removed the ExecuteInEditMode attribute from the components used (SpriteColorBlend) for the build and it did the trick. Can you look into this? Hi Maciej, we hope to have a great update soon, with many new features and errors solved. Please send us an email to ‘hello (at) ibuprogames (dot) com’ if you need more information.